What do we mean when we talk about public art? And in a time of rampant austerity is there a need, or even a desire, for money being spent on such cultural furniture for the public domain? As an artist and a curator of exhibitions and projects I would of course argue in favour of such things, you would probably think me odd if I didn’t. But this article is not about the worthiness of art in times of austerity, it is in fact about the kind of public art that is being produced, where it is being placed and what people’s understanding of it actually is. If you were to walk around Leeds City Centre looking for examples of art in the public realm, one would almost certainly be able to cite a number of high profile contenders such as Henry Moore, for his Reclining Figure (Elbow) outside Leeds Art Gallery, The Black Prince and his phalanx of torch bearing nymphs surrounding City Square and the Drayman with his barrel on Dortmund Square. 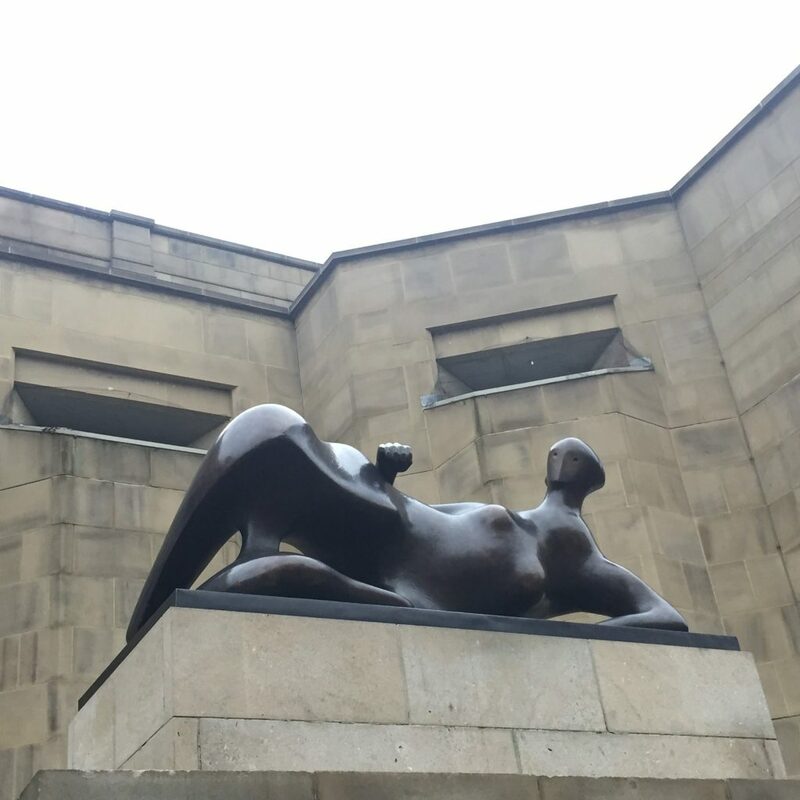 More recently we have seen the installation of a 2001 Piece entitled ‘Legs Walking’ by Kenneth Armitage at the bottom of Park Row; Armitage being one of the region’s foremost sculptors of the last century already has a sculpture ‘Both Arms’ (2000) on Mandela Gardens. As the tools, materials, concepts and strategies behind art production in the studio have changed in the last half-century, so too has public sculpture. At the same time as technology and ‘new media’ have become central to the practice of the contemporary artist, these things have also taken over visual culture in the public realm, creating the feeling of the continual advertisement of products and services that we are so used to. In amongst this arrives the contemporary artist with an ever shrinking budget and, more often than not, accompanied by a remit that revolves around educational, civic or heritage agendas. Whilst the first point is always an undesirable one the second is understandable, and worthy too. 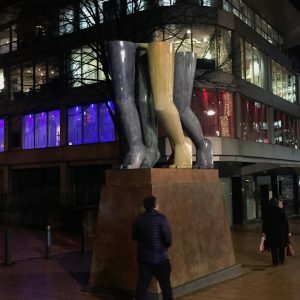 The monetisation of public space and shrinking finances ensure that the monumental works like Moore and Armitage are, generally speaking, out of the reach of most and are instead supplanted by more financially achievable techniques. With this in mind we return to our Art Crawl around Leeds looking for public works of art. Bearing in mind the aforementioned changes to art production values we instead have to look with different eyes at the things that surround us, are we being advertised at or is this art? Not always is the answer a clear one. Very occasionally the monumental does still rear its head but in a very different form. The ‘Athena Rising’ mural by Nomad Clan commissioned by East Street Arts along with LeedsBID for the side of City House (now Platform), above the train station, is the biggest in Europe. The Neville Street tunnel that brings you in and out of the city towards South Leeds has since 2009 been home to a sound art work by German artist Hans Peter Kuhn. The only visual aspect of this audio work that has played continuously since its installation nine years ago, is the light sequence on the left hand side of the tunnel as you are leaving the city. Elsewhere, existing street furniture such as the junction boxes that control the traffic lights around the city have been treated as blank canvases for commissioned artworks. Different artists were asked to provide images that could be transferred on to the surface of these dull grey boxes around the City Centre. 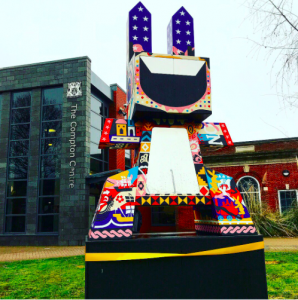 Over in Harehills a new commission by Ian Kirkpatrick has been installed in front of the Compton Centre, a bright shiny, multi-coloured robotic looking rabbit. And what of South Leeds? What would a public artwork for South Leeds look like, what would it symbolize? Does South Leeds need public art? Regardless of need, does the area want public art works? I am going to leave these questions hanging here and offer you the reader, an opportunity to have your say. Use the comments thread beneath this article to talk about ideas that you may have based on these questions. One final thought . . . you may want to talk about public artworks that you have seen elsewhere the good, the bad or just plain ugly. If you want to contact me directly e-mail Bruce at basementartsproject@gmail.com you can also find BasementArtsProject on Twitter, Facebook, Instagram and Pinterest. Have any of the proposed public artworks appeared on Dewsbury Road yet? Not yet … Planning approval was granted in January 2018. I suspect installation is awaiting completion of the roadworks. Thanks for the update Jeremy. Glad to hear it’s still going ahead. Will be interested to see what it looks like and hear the public’s reaction to it.